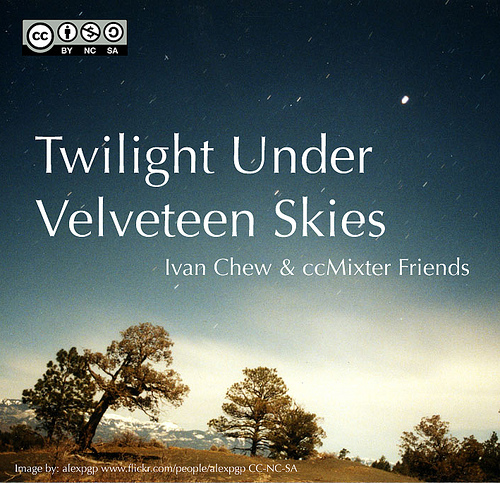 After 7 long months of working and waiting, Ivan Chew and his ccMixter pals finally released their collaborative Creative Commons album, “2009 Twilight Under the Velveteen Skies.” Comprised of 6 extraordinary soothing tracks – five are classified under the New Age genre and one is an instrumental Rock New Age track. Listeners are not only going to be amazed with the creativity, but also with how this smooth sounding album was formed. It’s very peculiar, actually, but thanks to Creative Commons, every artist’s dream is possible. Ivan Chew never met his ccMixter friends in person. How did they record and mix this album, you ask? Simple, it all worked thanks to the Internet. It all started when Ivan Chew made “Twilight Rock” available for digital download under CC license. His virtual pals from ccMixter did their magic by mixing sounds in his song. And voila, the album compilation was born. Cool, right? “2009 Twilight Under the Velveteen Skies,” as said, has 6 relaxing songs. This album will simply make the listeners feel the coming of dusk. Hey, Ivan Chew and company called this album with such name for a reason – they want to epitomize the relaxing and serene feeling of twilight and how soft and smooth the “transition” of light will be at this hour. The track list and credits can be seen below. This album is not only beautiful, relaxing, and spiritual, it can be also said to be inspirational to artists longing to mixed and be playful with their music. “2009 Twilight Under the Velveteen Skies’” rise will mean success to Ivan, to the ccMixter who helped him, and to the artists that desire a chance to showcase their talent and great taste in music. This work is licensed under a Creative Commons Attribution 3.0 Singapore License and is available as a free album download from Archive.org. Wow. It's a really flattering review, iceb0x. Glad you liked the songs. I speak for the rest of my generous collaborators to say Thank You!